Be your own barista and create amazing tasting coffee to rival the finest cafés. The Sage by Heston Blumenthal the Dual Boiler coffee machine is for the coffee connoisseur who likes to regulate every step in the espresso process. You can extract espresso and texture milk at the same time, allowing you to capture the delicate aromas of the espresso in your coffee by having both the milk and the expresso ready at the same time. Precise Espresso Extraction – Dual Stainless steel boilers and heated group head, both regulated by Heston Blumenthal digital temperature control technology (PID), give water at exactly the right temperature, eliminating temperature surfing for flawless espresso quality, shot after shot. The Dual Boiler™ also features an Over Pressure Valve (OPV) helps to prevent bitter flavours in the shot, by limiting the maximum pressure during the extraction. 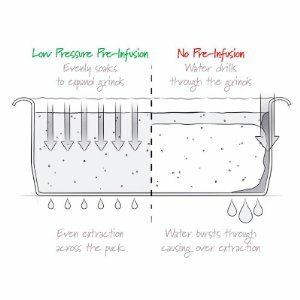 It also offers a true low pressure pre-infusion, which slowly increases the pressure to gently expand the grinds for a smooth extraction. There is also a shot clock and pressure gauge to help you fine-tune your barista skills. Micro-foam Milk – The steam wand, powered by the reliable steam boiler, instantly delivers the pressure to make micro-foam texture similar to commercial machines that enhances coffee flavour and is necessary to create latte art. 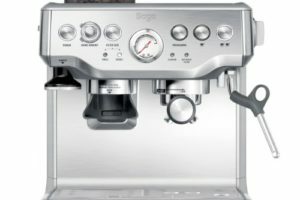 Barista’s Choice – The Sage by Heston Blumenthal the Dual Boiler coffee machine is the professional Barista’s choice for their home machine. Stainless steel espresso boiler with actively heated group head ensures temperature stability from the tank to the cup. Reliable stainless steel steam boiler for instant and connotes steam. 1. 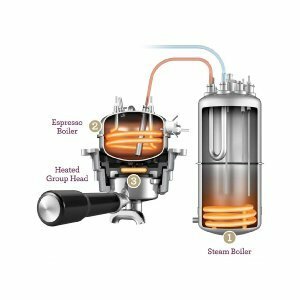 Dedicated Steam Boiler: Delivers steam on demand, allowing you to texture for 1 cup in less than 40 seconds, or repeatedly for multiple cups. 2. Dedicated Espresso Boiler: With electronic PID control, delivers exact water temperature to +/-1ºC. 3. Heated Group Head: Maintains temperature stability throughout extraction. PID controlled. Without this gradual increase in water pressure, “Channelling” or “Drilling” can occur. This means that water takes the path of least resistance – usually the weak spots between the coffee pick and the wall of the filter basket, instead of flowing levelly through the entire coffee puck. This results in defects in flavour throughout the cup. Pressure: Limit maximum extraction pressure. Steam: Simultaneous texturing and extraction, and milk ready in less than 40 seconds. Pre-Infusion: Low pressure pre-infusion. Programmable pressure and duration. PID electronics limit the extraction temperature to +/-1ºC of the programmed temperature to minimise fluctuation during extraction and to maximise espresso flavour. Adjustable espresso boiler temperature to suit coffee beans of different roasts and origins, and adjustable steam temperature to suit different milk amounts. For machines not equipped with a boiler, heating is conducted via a continuous stainless steel coil embedded in a one-piece aluminium block. The coil is wrapped tightly around the heating element to provide superior temperature control. Increase temperature stability by pre-heating be water to 70ºC before it enters the espresso boiler. 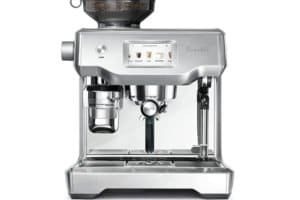 Find best priceIt may cost more than a lot of other manual espresso machines, but the Sage by Heston Blumenthal the Dual Boiler coffee machine is a rather fantastic coffee machine. It’s not for everyone, but if you’ve outgrown your starter machine, are ready to experiment a bit more with your coffee and want top quality results every time, it’s worth every penny. 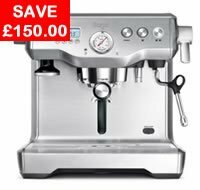 If you’re looking for a starter machine or something a bit cheaper, take a look at the Delonghi ESAM 4200 coffee machine. 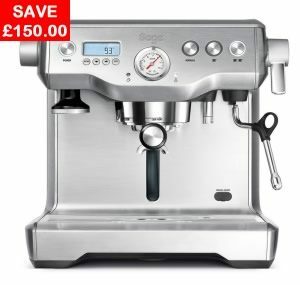 Does the Sage by Heston Blumenthal the Dual Boiler coffee machine include a free grinder? No the dual boiler doesn’t have a grinder. 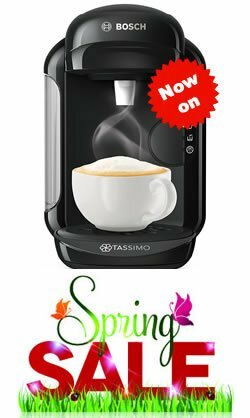 Is it a bean to cup machine? No, this model is not a bean to cup machine. How many espressos a day can the Sage by Heston Blumenthal the Dual Boiler coffee machine make? It’s a domestic machine, that produces professional quality coffee. You could use it for a small coffee shop, but you may void the guarantee. It could quite easily make several hundred a day and with the proper maintenance, cleaning and descaling would probably last a long time.